Belief in God is childish. So reports Justin L. Barrett, an Oxford University professor who studies the cognitive science of religion, in his new book Born Believers. To be more specific, Barrett argues that belief in gods appears to be a naturally occurring human phenomenon (21). He points to new research about systems of the human mind which develop very early, and which make belief in some sort of god almost inevitable for children: “They have strong propensities to believe in gods because gods occupy a sweet-spot in their natural way of thinking: gods are readily and easily accommodated by children’s minds and fill some naturally-occurring conceptual gaps rather nicely” (25-6). Making a dichotomy between nature and nurture seems unnatural to Barrett: “Given a certain kind of biological endowment and the ordinary sort of world we are typically born into, we will typically develop certain properties and attributes. These sorts of traits—those that are almost inevitable because of our biology plus the regular sorts of environments people grow up in—are natural traits. Belief in gods of some sort or other, and maybe a supreme capital ‘G’ God in particular, may be largely natural in this sense: biology plus ordinary environment, no special cultural conditions required” (25, emphasis in original). 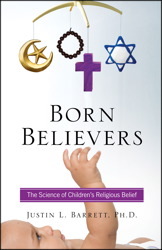 Born Believers: The Science of Children’s Religious Belief is a two-part overview (the evidence/the implications) of nascent research in child development which suggests children naturally believe. Barrett builds his case using a variety of studies regarding infant and child reactions and behavior. To lay the groundwork, he points to research which indicates that from infancy children show signs that they can, to some extent, distinguish inanimate objects from beings which have intentions and purposes. Babies learn that humans can move on their own (31), that agents act to attain goals (33), that agents need not resemble humans (34), or be visible (36). There seems to be a good deal of creative reasoning on the part of researchers described, and Barrett hedges a bit with a few “maybes” and “perhaps’s” and “I suspect’s.” Anthropologists and psychologists have developed theories about “agency detection” whereby good evolutionary reasons have led humans to sense agency in a hypersensitive manner. It’s better to mistake a boulder for a bear because we’re better safe than sorry, so the reasoning goes (44). Infants demonstrate such cognitive tools with a “heightened tendency” to make such distinctions, opening the door to the idea of gods at work in the world (45). “Secret agents” are sought to explain inexplicable things. In chapter two Barrett makes the case that children demonstrate a “promiscuous teleology,” an eagerness to “detect design and purpose in the natural world” (47-8). By twelve to thirteen months of age, babies seem to be able to distinguish between random happenings and purposeful order. Evolutionary psychologist Jesse Bering’s research on “Existential Theory of the Mind” seems to indicate that humans “have a strong tendency to seek and postulate meaning behind events” (54). This tendency isn’t confined to children. “Even among staunchly committed anti-design evolutionists, the language of design and purpose appears unavoidable. The way our brains naturally develop compels us to wonder who or what is behind the evident design and purpose in nature” (57). If children are born with the ability to conceive of gods, Barrett locates one motivation to do so in our anxieties about the world. Much of what happens seems outside of our direct control. Further, much of the world seems outside of our ability to create. Children as young as four years old tend to believe that humans can make dolls and telephones but not natural objects like fruit and dogs (63). Contrary to Jean Piaget’s assertions that children attribute all creation to humans, more contemporary research indicates children more often posit a higher power of creation (64). But Barrett agrees with Piaget that children tend to attribute superhuman powers to adults, a view which gives way over time, but which can remain in beliefs about the power of gods. In the next two chapters Barrett describes research experiments which suggest that “godly properties of super knowledge, super perception, creative power, and immortality are quite intuitive, at least for young children” (80). Such beliefs seem to play upon default human assumptions, rather than violating them. For instance: in one experimental game a researcher places a rock inside an empty box of crackers and asks a three-year-old what they think is inside. They are surprised to discover a rock, but if asked what other people would say is in the box they will say “rock,” assuming that everyone else will have the knowledge that they have, including their parents and God. Five- and six-year-olds consistently responded that God would know, but that others would not know (92-93). In other words, they were able to attribute a higher knowledge to God than humans. To account for potential cultural biases about the attributes of God Barrett also tested Mayan children, who are taught about a pantheon of gods, some less powerful than others, and they, too, showed “some sensitivity to the shades of difference in potential knowledge of the various deities” (98). Barrett notes that a few preliminary studies such as the cracker box experiment indicate that children do not attribute full-blown omniscience to God, as this is likely outside their range of understandable conceptions, but that God has “super knowledge” (he notes the same is true for many adults, 102). How far-reaching are such experiments and tests? He acknowledges the cultural biases that can infect such research and repeatedly hints that the studies to which he refers are somewhat limited (100, 109, 112, 118, etc.). Chapter five is the weakest in this regard, as he attempts to uncover what sort of attributes children assign to deities such as perception, immortality, and divine goodness. More interesting in this chapter is Barrett’s speculation about a “sensitive period” in a child’s development regarding belief in God similar to that of language acquisition, musical competency or food tastes. This could help account for different particular beliefs about gods within a more general common acceptance of the idea of gods cross-culturally. But Barrett only offers suggestive parallels sans research on this fascinating question, which leads into part two of the book, “The Implications” (125). Here Barrett posits a “Natural Religion,” which tends to develop cross-culturally, and which he distinguishes from higher Theology. Base-line beliefs of “natural religion” include: superhuman agencies exist, the natural word demonstrates intentional design, moral norms exist, people may live on after death, etc. Various religions then expand on such principles as individuals employ “intellectual resources” to flesh out a theology. “My point,” he adds, “is not that the cognitively unnatural or conceptually cumbersome concepts of theology are wrong or right, only that they take more time and effort to acquire, and certainly fall outside of children’s natural predilections” (136). So children have naturally-developing receptivity to many core religious beliefs, but that specialists also develop higher concepts which require some “cultural scaffolding” in order to accept. If children are born believers, Barrett argues, it is not belief in “any specific religious or theological tradition” (144-5). Barrett argues that “religion” in his view is not “theology.” He points to a similar distinction in the way humans understand the natural world in general. Consider “folk ideas” about health and nutrition verses the intricacies of “reflective beliefs” about human metabolism, for instance (150). If Barrett too easily collapses world religion diversity here, his observation that early beliefs tend to carry through behind the scenes into adulthood draws important attention to some of the internal diversity on religious beliefs that can exist within ourselves. Adults “may actually have two (or more) different sets of ideas about God: one set is the fancier, theological set…and the other set is the one that looks much more like a human and is easier to use in real-time situations” (157). When asked to repeat a religious story about an answered prayer back to a researcher, adults tended to fill in gaps and even misremember aspects of the original story in ways that fit their own preconceptions, for example (153). He found similar results among Christians in the United states and Hindus in India, but this was another part of Barrett’s book which cries out for better conceptualization and experimentation. By this point in the book it’s clear that Barrett believes his research indicates that belief in God or gods is childish, so he pauses in chapter seven to ask whether such “infantile” beliefs should be carried through to adulthood (161). Sigmund Freud put forward one of the most famous arguments about belief in gods being the projection of a childhood anxiety onto the natural world. But Barrett says Freud’s “evidence-thin account of the pre-historic origins of religious thought” lacks credibility today, so others have stepped in to fill the conceptual void. Richard Dawkins, for instance, compares belief in God to belief in Santa Claus—something to be cast aside as one matures (164). Barrett finds such assertions to be intellectually lazy and perhaps disingenuous (164). For one thing, adults generally do believe in a god but not in Santa Claus. Some adults reach a solid belief in God later in life, but Barrett sees no such late-comers to Old Saint Nick. More importantly, belief in a god can also be classed alongside other beliefs adults carry from childhood, such as gravity, a sense of the continuity of time, and that their mothers love them. “Why does a ‘childish’ idea automatically mean a bad, dangerous, or wrong idea?” he asks (165). The possible irony, then, with attacking religious belief on the grounds that it is a ‘childish’ product of evolved thought is that the atheist who believes in Darwinism may be forced to choose between (1) doubting many if not all of his beliefs because they have the same dubious origins in childish thought including his belief in Darwinism itself and (2) conceding that precisely because such beliefs are largely a product of early-developing cognitive inclinations, they have a fair likelihood to be true. I favor the approach that regards our minds as basically trustworthy to deliver true beliefs, and that our naturally arising ‘childish’ beliefs should be regarded as true until we have good reason to suspect them as being problematic (168). Barrett asserts that there may be other compelling reasons to reject belief in God, but the discovery that theism is “childish” simply isn’t one (“beneficial” does not necessarily mean “true,” for Barrett, but he extends the benefit of the doubt and enjoins further reflection, see 226). He also takes issue with Dawkins’s “meme” theory: the idea that religion is essentially a self-replicating dangerous virus (181). Among other conceptual difficulties, this theory overlooks research which shows “we are biased to believe some sorts of things over others, from some people over others” and seems to play into an “anti-religious agenda” rather than attempting to account for many confounding variables (183). If a biological metaphor is needed for religion, Barrett suggests E. coli, “an inextricable part of human life” which “is essential for normal human digestion,” but which also can “lead to illness and death under certain rare and largely preventable conditions” (190-1). The limitations of this replacement are fairly obvious. If theism of some sort is natural to humans, is atheism unnatural? Barrett reports being asked this question at various lectures he’s delivered on the subject of born believers. “This is an area needing much more scholarly and scientific attention,” Barrett’s chapter nine notes, but he offers a few provocative suggestions for further consideration. “If ‘natural’ means a typical expression of human nature, then, yes, their lack of belief is unnatural,” but before atheists can take umbrage he adds that such unnaturalness is also seen in concert pianists, top-rate scientists, and theologians (195). He suggests some personal (biological or psychological) and social (environmental) factors that might contribute to atheistic belief. One suggestion is psychologist Simon Baron-Cohen’s “male-brainedness,” a controversial name for a controversial idea (197-199). Another suggestion is that caregivers tend to resort to compensatory strategies to help cope with their inability to fully control the well-being of their loved ones. Survey data indicates atheists tend to be single, childless males. Moreover, a rise in “pseudo-agents” like fate, destiny, luck, and other psychological fill-ins help people account for order and disorder, meaning, and purpose in their lives, filling a space otherwise reserved for belief in God. He closes the chapter with a seven-point list of how to be a “satisfied, confident atheist” which includes tips like “don’t have kids” and “take time to reflect” (211-2). If these suggestions about factors contributing to atheism aren’t persuasive, Barrett also responds to a frequently-invoked explanation regarding the prevalence of religious belief: “The Indoctrination Hypothesis” (172, see also 10-11). This is the basic idea that children believe in gods because their parents tell them to. Barrett acknowledges there are enculturational influences which affect particular religious beliefs, but argues that the “Indoctrination Hypothesis” is mostly a just-so story which fails to account for why more general types of belief in supernatural agencies and design tend to arise more frequently than others, or what those beliefs tell us in terms of human development (172-9). (Besides, he argues, real parents know better than thinking their children will always or easily accept whatever they are taught). He carries this issue into chapter ten, in which he examines the charge that religious instruction constitutes abuse, as Dawkins, Christopher Hitchens, A.C. Grayling, and others have claimed. Barrett takes them to task for relying on anecdotes while ignoring “considerable research on the relationship between religious commitment and psychological and physical well-being.” The tables are turned on those who suggest religious indoctrination is necessarily abusive, as Barrett argues that religious teaching often inculcates world-views and “strivings” which “tend to [result in] better physical and mental health” (224). He points to surveys and research which suggest that committed theists are “psychologically healthier and better equipped to cope with emotional and health problems than non-believers” (216). He suspects, however, that such “New Atheists” are legitimately concerned about parents whose love is made contingent upon accepting and agreeing with their beliefs and commitments, and agrees that such parenting “represents a moral failing on the part of those parents” (222). Such critics are also rightly concerned, Barrett says, when “parents teach their children ill-conceived notions and then go on to discourage children from critically examining” them (223). I was disappointed that no studies on these matters are offered here, though they are somewhat peripheral to the purpose of the book. Instead, the final chapter of the book speaks directly to how parents can responsibly encourage children’s natural religious development. If children are naturally religious, they also require “suitable targets” to hone their religious sensibilities in productive directions, Barrett says (229). He compares the situation to food preferences; a child’s diet may keep them alive but not necessarily healthy (230). He offers ten specific things parents can do to foster a child’s religious development. These include things like starting early (children as young as three start to readily grasp religious ideas in observable ways), making God a part of “mundane circumstances” rather than only on special occasions, “making religious ideas relevant for behavior,” associating religious commitments “with a full range of emotions,” and “forming a strong, secure relational attachment with your children” (231-243). Further, “tools for reasoning and learning may be far more valuable than any content you might teach,” so Barrett encourages parents to “teach how to think, learn, and discern truth” (233). Humility on the part of parents is enjoined—don’t be afraid to say “I don’t know,” but perhaps try to discover the answer together, he suggests (232). This introduces an interesting paradox about parents’ beliefs and the ways Barrett says they should pass them on to their children. “Don’t say you believe in it or have faith in it; talk as if there is no question about it” (235). Saying “I believe in oxygen” might be counter-productive as opposed to simply discussing its properties or importance. A child may be confused by such distinguishing approaches to knowledge about God and the natural world. But at the same time Barrett has also enjoined humility, a willingness to recognize one’s own beliefs may be mistaken and a recognition that conflicting beliefs of others might have something to teach us (232). Negotiating both confidence and humility may be one of the most difficult tasks faithful parents must perform in teaching their children. Barrett encourages parents to examine their own beliefs to see what “the exercise of reason and scientific evidence have to offer us by way of challenge, correction, or affirmation of our beliefs” (230). Such an exercise seems like a life-long process, however, while Barrett enjoins assertions of fact over quibbling about details. Perhaps that particular suggestion would speak more to interacting with younger children (elsewhere he offers a few vague suggestions about teaching both evolution and theism to children, and suggests possible age ranges when such distinctions might be graspable. Research suggests young children raised in secular and theistic homes all struggle to make sense of evolution in their early years, 72). Evolutionary psychology is a relatively new and highly contested field investigating some of the most basic and elements of human existence today, from the relationship between biology and consciousness, to the existence of gods, and many things besides. Barrett’s book compiles some compelling evidence from the cognitive science of religion suggesting that “people may practically be born believers” (9, emphasis in original). Infants detect powers in the world causing chaos and order and attribute this to agents seen and unseen, children are comforted by the belief in protection from a powerful deity who created a fascinating world to explore, and adults carry many of these beliefs to the grave. “I’ll be the first to concede,” Barrett adds in an early footnote, “that alternative glosses of the data to date may be reasonable and new data may change the state-of-the-art as presented here” (263, see also 16). But he is confident that belief in God is natural to human development, which doesn’t necessarily prove or rule out the existence of God. Perhaps the main trouble in all of this is the ever-present temptation to “take the money and run,” so to speak. Barrett himself recognizes this danger, as when he tells about the Hindu man on a train who, after hearing about Barrett’s research, suggested that belief in reincarnation fully explains why children are so predisposed to believe (9). Or when he quotes from a note he received from a Muslim student following a lecture, which let him know that “more than 1400 years ago” the prophet Mohammed explained that “every human is born believing in GOD naturally” (145). Mormons might read the belief in a pre-mortal existence into Barrett’s conclusions, selecting the evidence which helps support such a thesis (Mormonism receives incidental attention on 132, 146, 216). An atheist could point to their present relatively unique status as unbelievers as suggesting the next evolutionary leap forward—sure, human history shows the vast majority of people believe in some sort of gods, but they are simply ahead of the evolutionary curve. So while the book provides much food for thought and certainly deserves attention, especially since it represents a fairly new field of study (with some interesting connections to past efforts), Barrett doesn’t provide a compass with which readers can navigate respective theistic and non-theistic beliefs in terms of how such beliefs are supported by human biology and environment. That they are so influenced is argued throughout, but the sticky problem of identifying actual gods in the mix is adroitly avoided. This is most evident in his concluding advice to parents: “ultimately it is up to children to believe or not” (246, emphasis in original). Parents and teachers should recognize, he asserts, that “they cannot properly claim credit or blame if someone becomes a true believer or not…Though children may be ‘born believers,’ whether they die believers is between them and God” (246). This strikes me as rather rehashed, old news. What is allegedly new here? As I see it, Tom, the author is offering a one-volume exploration using cognitive and evolutionary psychology to explain the sort of theistic beliefs humans seem predisposed to accept. His own cross-cultural studies are particularly interesting, though they ought to be further pursued. For instance, he engages specifically with Hindu children in India, as well as Mayan children, to add to the more-frequent studies focusing largely on Christian children in the west. And there’s always the “Must See TV” response: If you haven’t seen it, it’s new to you! Good review. I’m sure that you’re aware of Plantinga’s arguments that evolutionary epistemology (what we believe and how well it is actually grounded in proper functioning faculties) leads to across the board skepticism about our ability to do evolutionary psychology, epistemology or science. He sees it as a general defeater of reliably functioning mental faculties for purposes of accessing the truth of matters. What matters is not truth, but whether it leads to survival. It is the same as for determinism, what matter is not the logical structure of the argument and valid rules of inference, but what the deterministic mechanism entails. I believe there is a good deal to be said for Plantinga’s views. I was surprised that Barrett essentially makes the same arguments against Dawkins and Dennett from a cognitive development perspective. Blake, Barrett cites Plantinga in the text in reference to his book Warranted Christian Belief, so there’s definite influence there. This is especially interesting review if you have a young child at home. Thanks. Thanks, Jenny, I found a lot to think about regarding raising kids in this book. Nice review, BHodges. Starting with the cover, and based on your initial description, it sounded to me like an inevitable idealogue train wreck a la anything by Dawkins. But it sounds like overall you found it to be well-balanced and modest in its conclusions? Interesting. This review caught my eye as our agent is presently shopping our co-authored book currently titled, “Born to Believe: The Religious-Spiritual Brain.” Looks like we might want to revisit out title choice! Nonetheless, your review was great, thank you. Although we do talk about the ease with which children are able to “suspend disbelief,” we take a different tact: We discern between religiosity and spirituality and talk about the neural systems apparently involved in each. What becomes apparent is that one seems to arise from the most evolved part of the brain. I’ll save the ending, for now. Thanks again for the thoughtful review. Cool, thanks, Russ. What called your attention to bycommonconsent? I believe I was following a Google alert. This is a topic and I try to monitor. Great, I’m glad you stopped in to comment, Russ.